lift it park it lock it – is this houston? 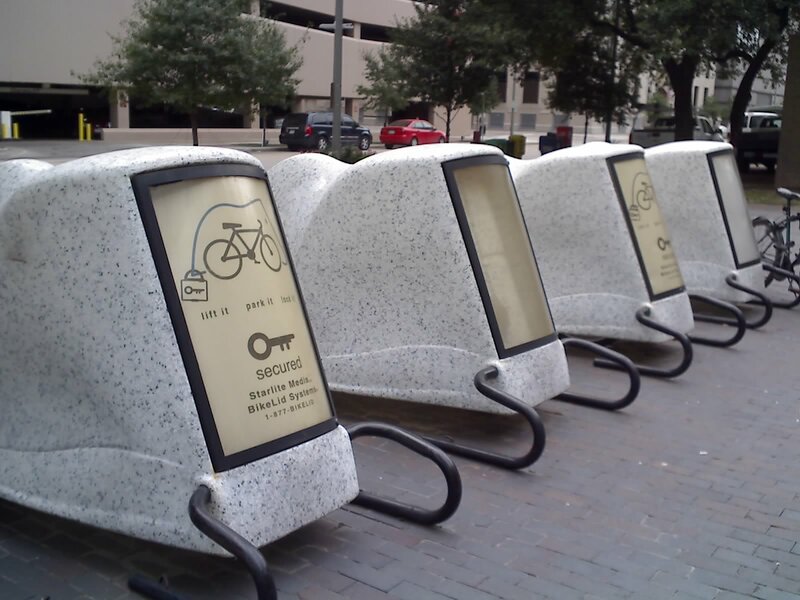 Starlite Media BikeLid system racks located outside the Downtown Houston Public Library. Great idea, but the racks don’t accommodate bicycles with racks, nor high seats, nor trailers, nor larger handlebars. Most people wouldn’t ride their bike if it was a bad weather day, so whats the point of having covered bicycle parking stands? I believe the city bicycling advocacy funds could be better spent by installing the ubiquitous metal grill bike stand in many more public facilities such as libraries, post offices, hospitals and public parks to grow the cycling as a form of transportation. How does that thing work? I always wondered what those things were. They are enclosed not so that your bike is out of the weather, but to protect your bike from the vandals that would otherwise steal or destroy your property just because they can. Bike covers give the same security to a rider that you have with your car. Point is to make riding irresistable so that most people can ride. I know a man who owns a $30k bike. I doubt if he parks it on the street. Many people don’t ride often enough because of the hazards. Point is to make biking safe from traffic, vandals & rust so they can. I and all my friends ride in all weather including up to six inches of snow. I’ve been riding around Texas for over 15 years. Houston is by no means a safe place to ride even with their so called inner city bike lanes. The city could have spent more effort on creating better bike lane signage within downtown rather than spend it on stupid bike racks like this one. Most avid cyclists will know the best place to lock up their bike that is safe from theft anyway, so the bike-lid racks are a moot add-on to the central business district. I thought those were just signs. Even though they may not be the best idea, I am just grateful we are being acknowledged. Maybe others will walk by and think of cyclists as being a part of the community. It’s definitely better than nothing. I would love to see more though-out bike lanes as suggested by pankaj.